Sunset Full Moon Cruise - Not to be Missed! All the details about the Sunset/Full Moon Cruise - Sunday, November 5 - don't miss this great evening! Please Join Us for a beautiful evening sail, and Support our Club's Fall Fundraiser - Sunset Full Moon Cruise! 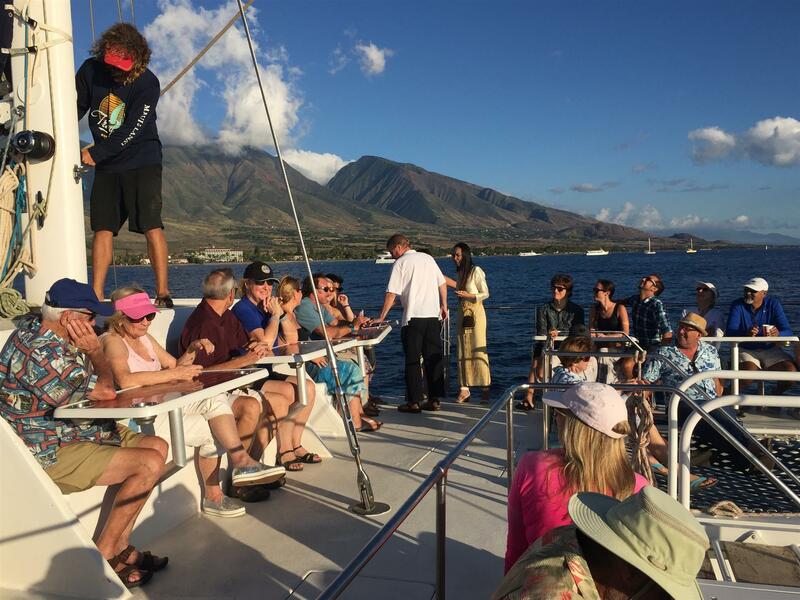 We will depart from Lahaina Harbor, and sail aboard a privately booked Trilogy Catamaran to watch the sunset, while enjoying premium cocktails, pupus, and LIVE music by Grammy Award Winning Artist, and honorary club member, Uncle George Kahumoku Jr.! Tickets are $89 and include Food, Premium Cocktails, Live Music, and Sunset Sail. All net proceeds will be used to fund the Rotary Club of Lahaina Sunset's annual "GO FOR THE GREEN" $2500 Scholarship that will be awarded in the Spring to a high school senior residing in Lahaina or Molokai that is pursuing an area of study related to sustainability.